At last! 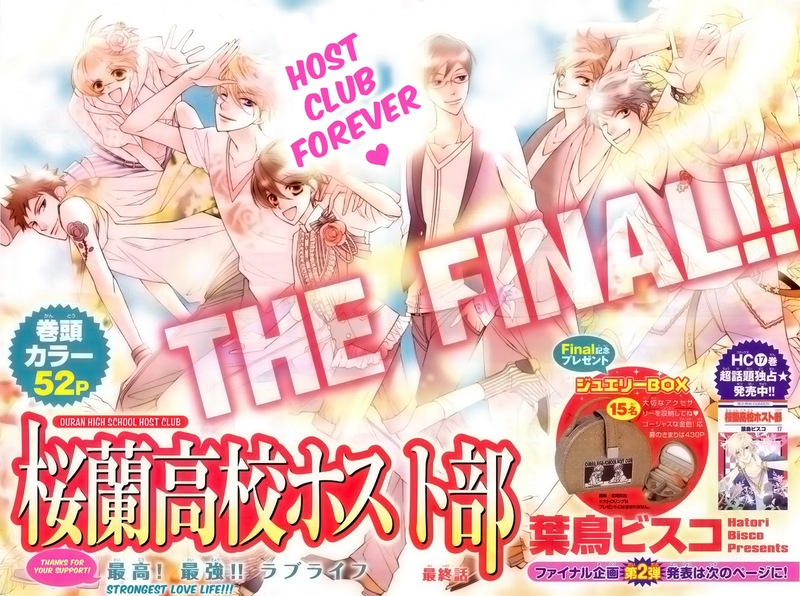 Here is the final chapter of “Ouran High School Host club.” I’d like to thank everyone for hanging in there with me for the last 12-chapters of this series. I’ve come along way as a translator and an image editor since I reluctantly started this series last year. The zip file, also includes the wallpaper. If you enjoyed Ouran and want to reread it, I encourage you to purchase the manga in Japanese or in English. In the US, volume 1 – 14 are available from Viz. Here’s a convenient link to my Amazon store where you can purchase all the available volumes of Ouran from Viz (currently, there’s a 4 manga books for the price of 3 deal going). At least buy a volume or two to let Viz know you like Ouran and that you want them to continue providing us with similar manga series. Plus, if you buy from my Amazon store, I’ll receive a tiny referral payment. As for the Japanese version, I recommend purchasing from YesAsia or Amazon Japan. I think buying the Japanese version will more directly help the mangaka. Akadot also has volumes of the series available, but their pricing is way too high for me to recommend them for this particular series. And finally — yes, I will translate any new content that appears in the upcoming Lala Special and if there is a following-on series or special Ouran stories in any of the Lala affiliated magazines, I will translate those as well. Also, I will be purchasing volume 18 in Japanese for the bonus content and if there is more comic material, I will translate it. Also, as for retirement of the series, it will happen as scheduled at midnight October 31st. All follow-on content will also be posted for only a month. Awwww what a great end to a great story! And I kinda feel so proud right now, they mentioned my school haha (I go to UNLV (Las Vegas), and yes, it's really a party school lol). Currently downloading right now. Thank you soo much for scanlating the series! I can't believe it's over. But all good things must come to an end. Greatttttt, merci, merci for your hard work these past month!!!! @daniela — Thank you :). I worked really hard to make this last chapter look special. I did a lot of trial and error in Photoshop. Okay, I'm not at ALL caught up with Ouran (one day I will be.. when I get money), but I decided to read the last chapter anyway *sheepish laugh* So.. Kyouya-kun likes Haruhi in a romantic sense? It's the thing that Honey-sempai said about him being confused about his feelings or something along those lines. Anyway! That bit had me tilting my head a little in curiosity. @Tin — That was Hani's question and Kyouya gave a nuanced “no” response.